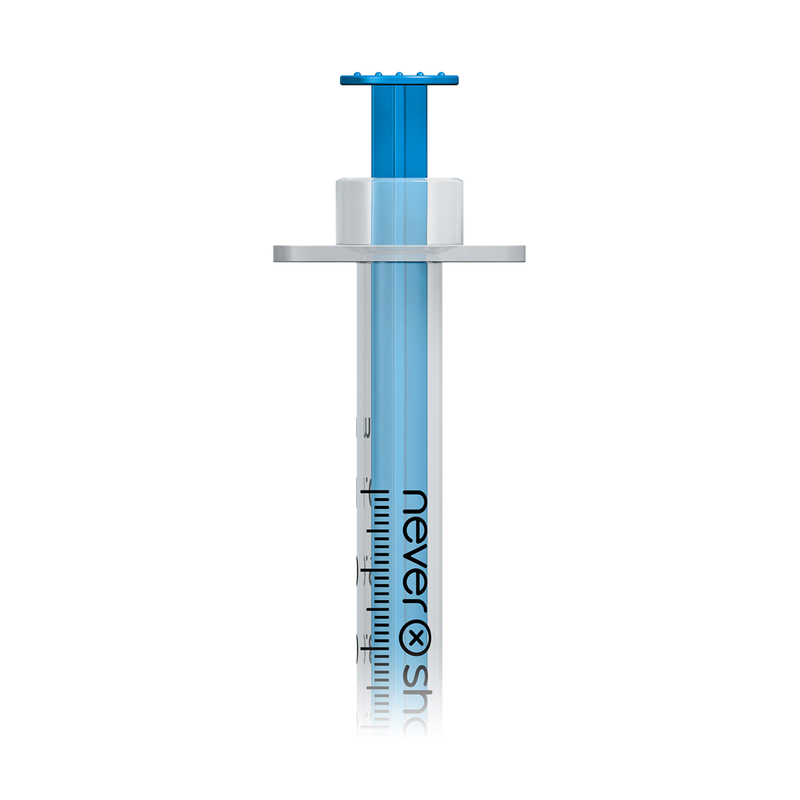 The needle safe is a space - and cost - saving needle disposal system for the Nevershare 1ml fixed needle syringe and BBraun Omnican syringes ONLY. The easy to use device holds 20 needles. Please note: it does NOT work with the Unisharp fixed syringe. The needlesafe means that people using the Nevershare 1ml fixed needle syringe can now discreetly carry the means of needle disposal with them at all times. Please note: the needle safe is for use ONLY with the Nevershare 1ml fixed needle syringe: it does not work with 'detachable' needles such as the unisharp fixed. The needlesafe also works with a BBraun Omnican insulin syringe. To order, enter the number you require in the Qty box above. is more likely to be used. 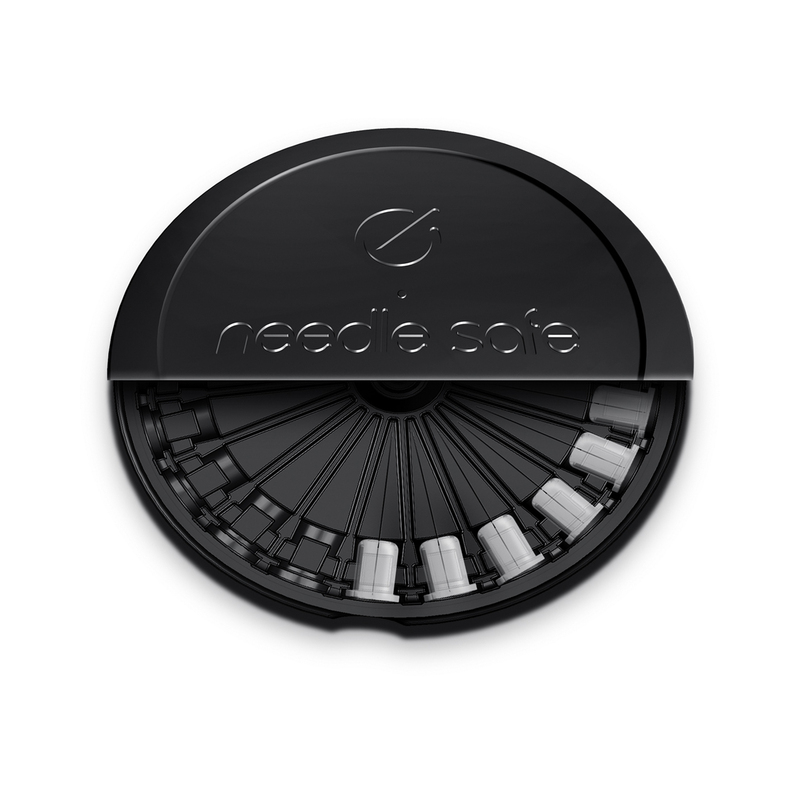 The needle safe utilises the unique 'snap-fit', glue free, construction of the nevershare syringe to remove the needle: with a single firm click, the needle and hub is quickly and safely locked in one of 20 individual chambers. 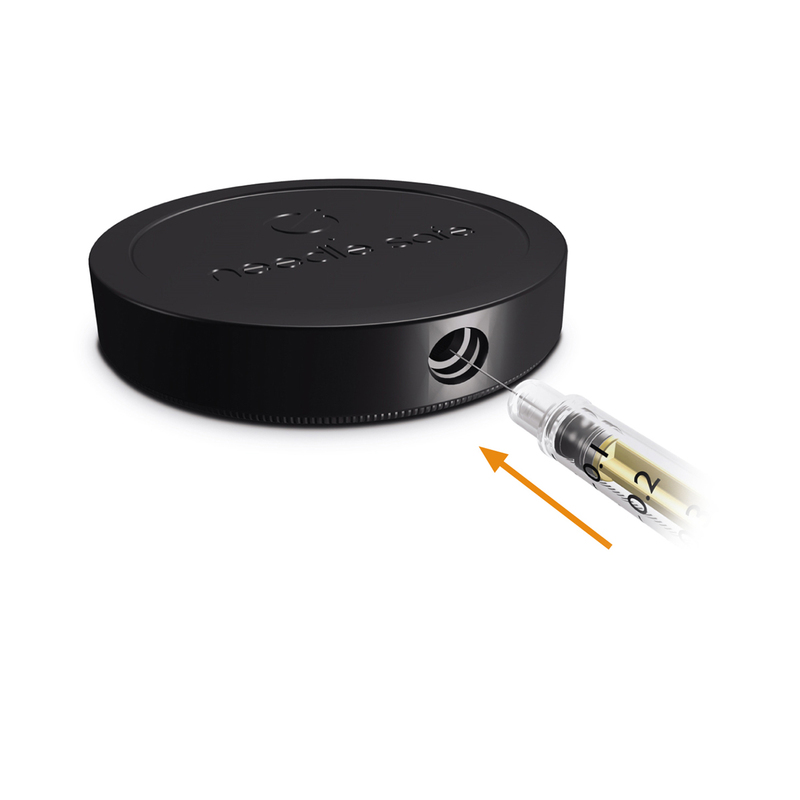 Once locked in place, the top of the needle safe can be rotated to both conceal the disposed of needle, and reveal the next empty chamber. The 20 needles can be counted for returns purposes, and the barrels can either be returned to the needle exchange for incineration in any bag or pocket, or (because they pose no risk, and are classified as 'domestically produced') can be carefully disposed of in the domestic waste. The needle safe is also compatible with the B Braun Omnican syringe, and is ideal for diabetics who want a highly portable, safe means of syringe disposal. To find out everything you need to know about the needle safe, read our product briefing pages which include an extensive collection of FAQ's, and a research section detailing how we've ensured that the needle safe complies with all the necessary safety regulations. To see a short youtube video of Monique Tomlinson from Exchange Supplies demonstrating how to use the needle safe, CLICK HERE (video opens in a new window). Orders placed by 3pm Monday to Friday are dispatched the same day. 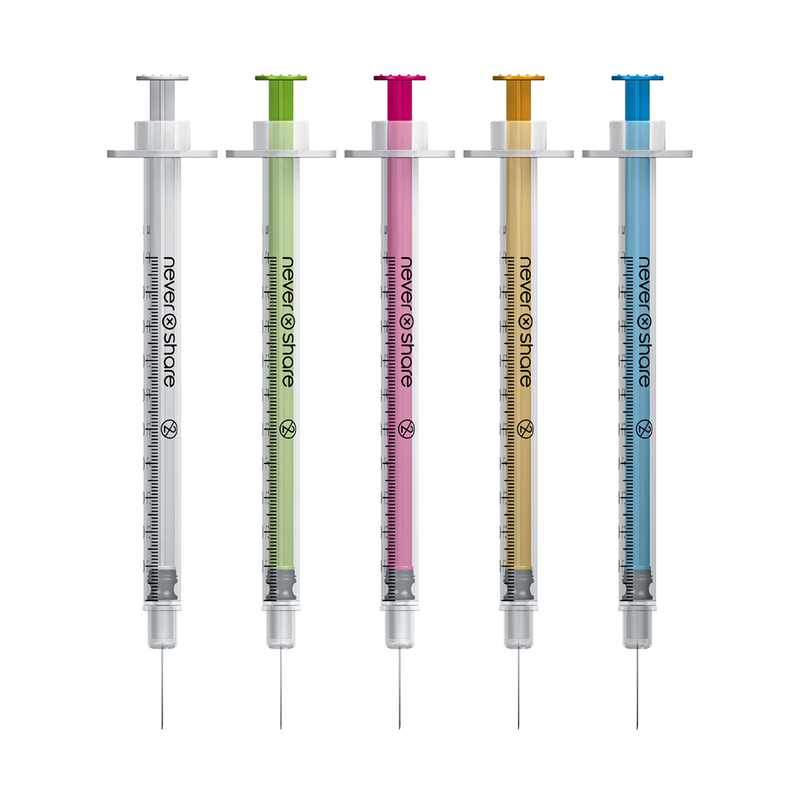 The needle safe will save services a great deal of money: not only is it less expensive than personal sharps containers, it is far more compact and so will result in huge savings in clinical waste disposal costs. The needle safe is a high quality injection moulded, polypropelene product that was designed and manufactured in the UK. Exchange Supplies is an ISO 9001:2008 registered organisation, and we developed the needle safe using our documented quality control systems and proceedures. The needle safe meets all the necessary quality standards, and full details of the research to demonstrate this, can be found here. We have extensively tested the needle safe to ensure that it meets the requirements of health care services giving it to clients to use to return used injecting equipment for safe disposal. Like most small black personal sharps containers, the needle safe isn't required to pass the UN Dangerous Goods Packaging Performance Test. This is because the UN test is for containers to be used for the transportation of waste by health care systems – and this isn't the purpose of the needle safe. The needle safe has been designed to enable drug users to easily and safely return injecting equipment to the needle exchange for disposal. When a needle safe has been returned to the pharmacy or the needle exchange, it is always placed in a yellow sharps bin for transportation and destruction. However, to confirm the strength and suitability for personal use, we commissioned an independent testing authority to performance test the needle safe to the UN performance standards. The UN standard requires the device remain intact through 8 drop tests from 1.2 meters (landing at different angles) with the needle safe at a temperature of both 23 degrees centigrade and -20 degrees centigrade. The needle safe passed these tests at both temperatures. The UN standard also requires the device to undergo a 24 hour 'stack performance' or crush resistance test, and withstand a 10Kg load for 24 hours. The needle safe easily passed this test. The final test in the UN schedule is a leak test, in which 10% of the volume of the container is filled with water, and then it is held at different angles to see if it leaks. Clearly a device designed to only hold the needle and hub would never contain anything like that much fluid, and the easy to use design of the needle safe means that it isn't leak proof unless it's upside down. In practice, like many personal sharps containers, the needle safe doesn't need to be leak proof because it doesn't need to hold fluid, and it doesn't need a UN transportation standard number – because when returned to a service, the needle safe is always placed in a yellow UN approved container for transportation and incineration. 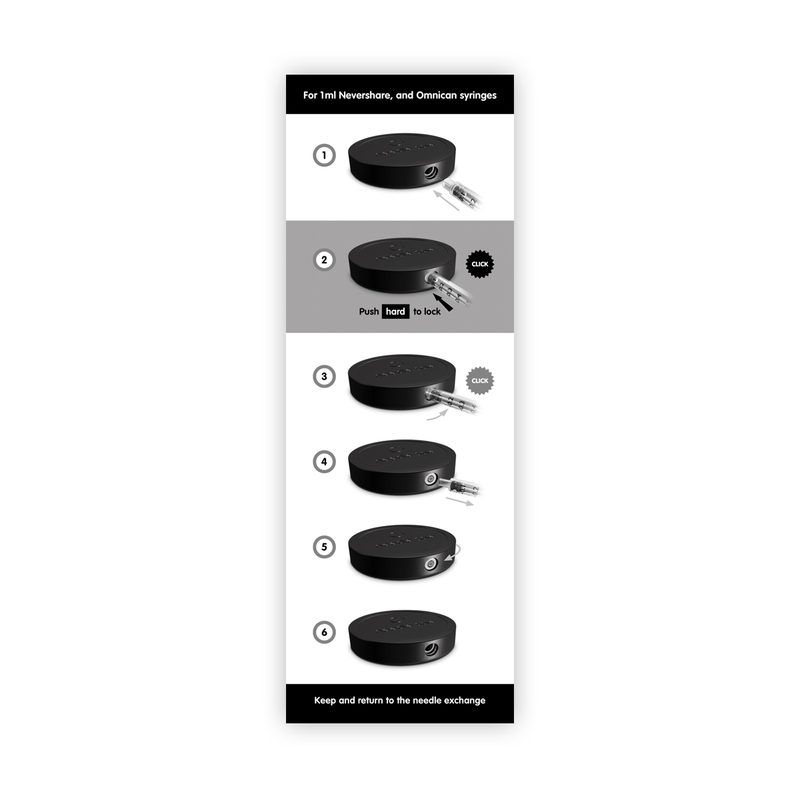 The tests therefore confirm that the needle safe is a secure, puncture proof, and highly crush resistant container, that injecting drug users can safely use to return their needles to the needle exchange for safe disposal. When yellow clinical waste bins are sent for disposal, they usually go to an incinerator and the needle safe is suitable for incineration. It is possible that the bins will go to a central processing plant (this is is known as 'alternative treatment') where the waste goes through a mechanical macerator to chop the waste into small pieces, and the small pieces are then fed into a sterilisation plant and heat treated before being sent to landfill. This means that when clients return the needle safe to you and place it into a clinical waste bin you can dispose of the bin in the usual way. The only difference being that a 20 litre bin that might normally only hold 15 personal sharps containers might take as many as 150 needle safes! 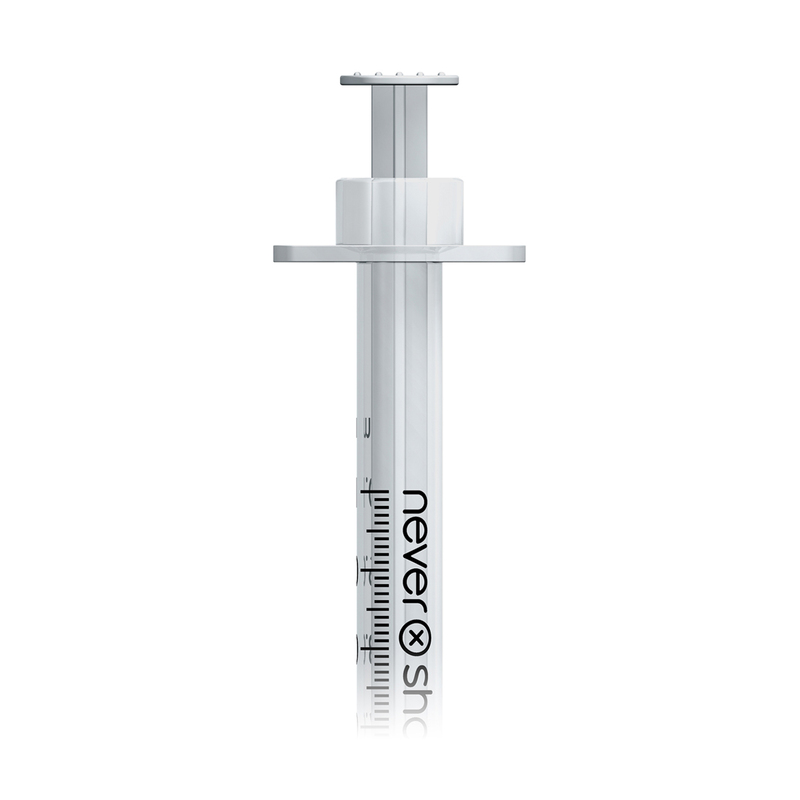 Below, and on the other product briefing pages we describe how you can, when distributing the nevershare syringe, replace bulky, noisy, and expensive to dispose of personal sharps containers with the needle safe. – if you have any questions that aren't answered on this practice notes page, or on the quality, research, or FAQ pages, please feel free to call us on 01305 262244, or send an email to andrew@exchangesupplies.org. 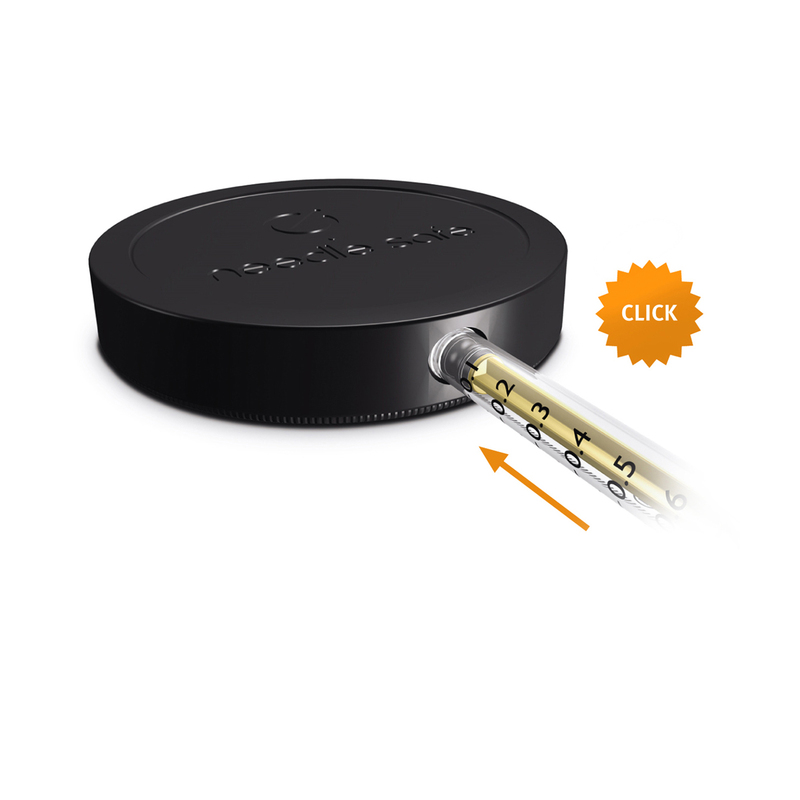 The needle safe is easy to use. 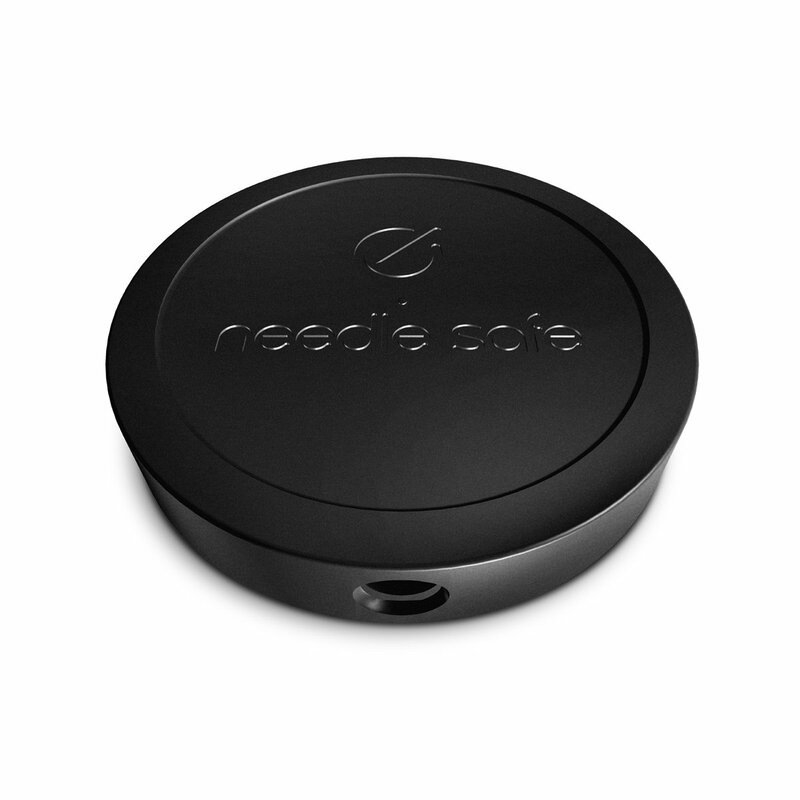 to locate the hub beyond the retaining walls, inside the needle safe. 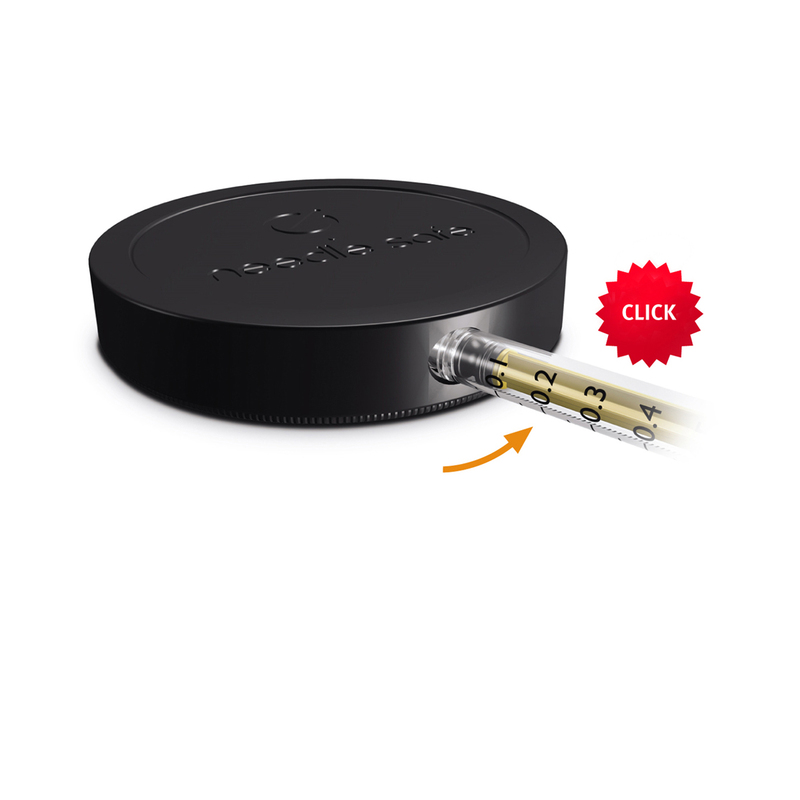 There is a positive click as the hub enters the device, and locks in place. Then the nevershare syringe can be separated from the hub by simply pushing the syringe barrel to one side. Once the syringe has been separated, the top of the needle safe can be rotated to the next chamber, ready to receive a second needle. Is the needle safe secure? Yes! The needle safe is much more secure than traditional disposal methods: it's small size and ribbed construction make it intrinsically stronger than bins, and having each pin locked in an individual chamber makes it a much more secure disposal method. This is in contrast to traditional 'sharps bins' which, because they hold the whole needle and syringe can just become a receptacle in which injecting equipment is stored for reuse. What about the syringe barrel? With the needle removed the barrel does not present a risk: any blood in it cannot infect anyone else becasue means of transmission (the needle) has been removed, so there's no way for any viruses present to puncture the skin, and enter the blood stream, of anyone else. Services will still encourage their clients to put the barrels in a plastic bag and carry them in their pocket to the needle exchange. Carried in this way they will take up significantly less space, and can easily be carried silently (unlike traditional sharps containers which are both bulky and rattle noisily). When returned, because they don't have a needle attached, the barrels can be disposed of in (cheaper to process) clinical waste containers rather than in sharp safe containers – potentially saving a fortune in disposal costs. Is it ok to put the syringe barrel in the domestic waste? Needles and syringes that are used in 'non-clinical settings' are, technically, not clinical waste, and the clinical waste disposal regulations do not cover the used equipment unless and until it is taken to a clinical setting and presented for disposal. This means that it is legal (and completely safe) to dispose of the syringe barrel in the domestic waste, although it's not something that we would recommend. If there is not provision for a separate container to hold the barrels won’t this then become drug litter? Injecting drug users aren’t a homogenous group all acting the same way, but the vast majority of injectors are extremely keen to avoid the stigma and community condemnation that is associated with drug litter in the vicinity of the places they live / take drugs, and we are therefore confident that the needle safe is not going to result in an increase in drug litter. Removal of the needle from the barrel makes it safer and much more portable, so we think that it may, in fact, increase returns. For the minority of drug users who do leave drug litter, research conducted by Stephen Parkin from the University of Plymouth shows that they often take harm reduction steps to reduce the risk to the community, but are not willing or able to carry and use bulky sharps containers. Offering these users a highly portable method of needle removal is likely to significantly reduce the risk associated with drug litter, reduce community concern and may (by making it easier to carry used equipment without risk of needle-stick injury) make it easier for injectors who inject in public places to return or safely dispose of used equipment, and therefore may reduce drug litter. If there is no provision for a container, what happens to the other paraphernalia waste e.g. swabs, spoons etc.? It is important to remember that the most paraphernalia waste doesn’t represent any blood borne virus transmission risk to injecting drug users or the community. However, if returned to the needle exchange other ‘paraphernalia’ can be disposed of in clinical waste, which will be cheaper than disposing of it in sharps containers. Otherwise, non-infectious waste can be disposed of in the domestic waste saving money for drug services, and focussing the returns issue on those items which pose a risk to injecting drug users, and the wider community. Injectors should be advised to render their stericups unusable by bending after use, and they can then be disposed of in the domestic waste. I tried the needle safe,and it wasn't easy to get the needle in how do you expect heroin users to do it!? It is true that because it is a new and novel disposal system there is a technique to locating the needle in the needlesafe. You have to know (or work out) how hard to push, but it's clear when it's not working, and it's clear when it has worked, so we haven't found anyone who couldn't do it easily after 2 or 3 practice runs. There are many aspects of preparing and giving an injection that have a knack to them, and aren't easy first time - but because it is an operation people are repeating often several times a day, they quickly get the hang of it, and it just becomes another of the skills they have. 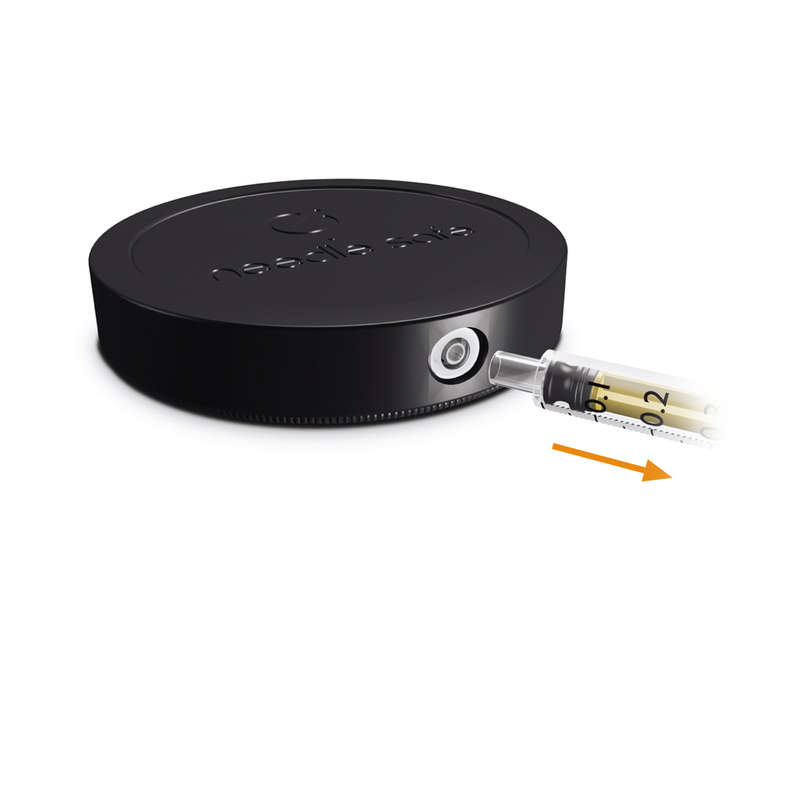 - If drug users lived in isolation from other injectors who could tell them how it works, and only had to do it once, ever, the technique issue could be a problem: but people talk to eachother, and use the needlesafe many many times, and so this isn't a real barrier to adoption. Is the needle safe unique? Yes, we have applied for patents covering the key features of the needle safe including the locking mechanism. No. Only the nevershare has the unique snap-fit, glue free, construction method that allows the needle to be removed in this way. What does 'performance tested to BS7320:1990' mean? Clause 3 of The British Standard test for this type of container is a puncture resistance performance test. We had the needlesafe independently assessed at the British Standards Institute BSI Material Test Laboratory on 14th July 2010. To pass 10 samples of the container must withstand a puncture resistance test in which none of them fail with a force of less than 12.5 Newtons, and with an average force of at least 15 Newtons. The needle safe passed the test by withstanding an average of 19.46 Newtons, and a minimum of 18.23 Newtons. This means that the needle safe is at least 50% stronger than it needs to be to pass the test, and is a completely secure storage device.